Each week, KRSM shares interesting and important live events happening around Minneapolis. Tune in to hear speeches, debates, readings, forums, performances, and discussions. Past episodes have featured mayoral debates, a reading by author Kiese Laymon, a forum on gentrification and land use, the TruArt Speaks youth poetry slam finals, a talk about intersectional organizing in Colombia, and a forum about alternative ways to pursue juvenile justice and rehabilitation. 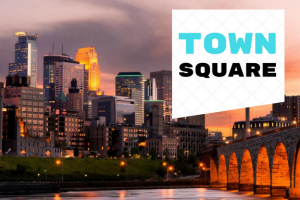 Listen to Town Square to hear what’s happening around Minneapolis. This week on Town Square, it’s Black Girl Magic! Join us for a recording from the People’s Movement Center where Daily Kos campaign director Irna Landrum and staff writer Kelly Macías shared lessons learned through covering the Stacey Abrams campaign in Georgia, as well as the “politics of joy” that caught fire in Minnesota. They’re joined by Angela Conley–who made history as Hennepin County’s first Black Commissioner–in a talk moderated by DFL Stonewall Caucus chair and former City Council candidate Erica Mauter. Hearing Their Voices: The Persistence of Violence Against Native American Women and Girls is a series of workshops led by Patina Park, J.D. Executive Director, Minnesota Indian Women’s Resource Center. Gain an understanding of the historical experience of colonization and its impact on violence against Indigenous women and girls. Learn the jurisdictional challenges that exist in Indian Country based on court decisions and federal law grounded in genocide or erasure of Indigenous peoples. Identify solutions to the legal jurisdictional problems. Gain an understanding of the historical experience of colonization and its impact on violence against Indigenous women and girls. Learn the jurisdictional challenges that exist in Indian Country based on court decisions and federal law grounded in genocide or erasure of Indigenous peoples. Identify solutions to the legal jurisdictional problems. Question and answer session with Racial Justice Organizer and Movement Mother Danielle Mkali, Socialist Alternative organizer and 3rd Ward City Council candidate Ginger Jentzen, organizers from the visionary MPD150, and Charlie Thayer of the indigenous resistance to Enbridge Line 3. Author Kiese Laymon Interview with Junauda Petrus and Erin Sharkey. A range of presentations that provide the legal and greater community with insights into major trends, practices and developments in immigration law and policy. Presenters included representatives from the ACLU and various immigrant rights organizations. Nekima Levy-Pounds and Black Pearl LLC kicked off their monthly series at the Brave New Workshop Theatre by welcoming John Thompson (President & CEO of Fight for Justice LLC ), Sarah Woodcock (Co-Owner of Trio Plant-based foods), and Marques Armstrong (President and CEO of Hope & Healing Counseling Services) for an evening of conversations, music, and building community. It’s just like TED Talks but with way more swag! Music by Scipreme.